So here we are again, in that exciting season where reporters stand out in the hurricane winds and driving rain and shout at us about how bad the weather is. How strong would the wind have to be to blow the reporter away? To avoid being bogged down in the math of it all we’ll just assume the nebulous “average size adult” and leave it at that. But first, a bit about wind. 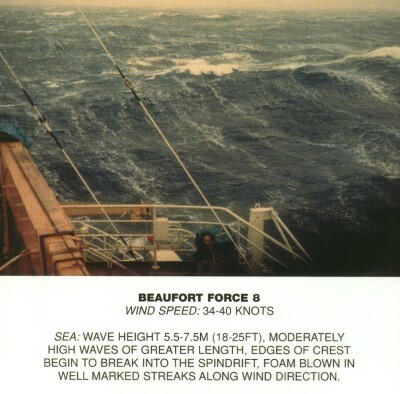 Wind speed is sometimes assigned a number (1-12) on the Beaufort Scale, a measure that relates wind speed to observed conditions at sea or on land. The Beaufort scale, however, is usually described in terms of how it affects things, not people. For instance, a Beaufort force of 3 is considered to be a “gentle breeze” of 8-12 mph that results in “leaves and small twigs in constant motion. Wind blows up dry leaves from the ground. Flags are extended out.” Sea conditions at Force 3 include the presence of large wavelets, crests begin to break; scattered whitecaps. A Force 8 is the proverbial “Gale Force” wind of 39-46 mph. At this speed, wind can cause cars to veer off the road, will break twigs and small branches and “generally impede walking.” Now that’s what we’re looking for –the effects on people trying to stand or walk. But the world is not a wind tunnel. Real wind is gusty, surfaces are uneven and slippery, and not all reporters wear safety harnesses or sensible shoes. Wind has many characteristics: speed, direction, turbulence, frequency and strength of gusts, and temperature, to name a few. According to this paper by Dr. Johnny T. S. Yu, the two characteristics that primarily affect a standing or walking human are the mean wind speed and degree of turbulence. 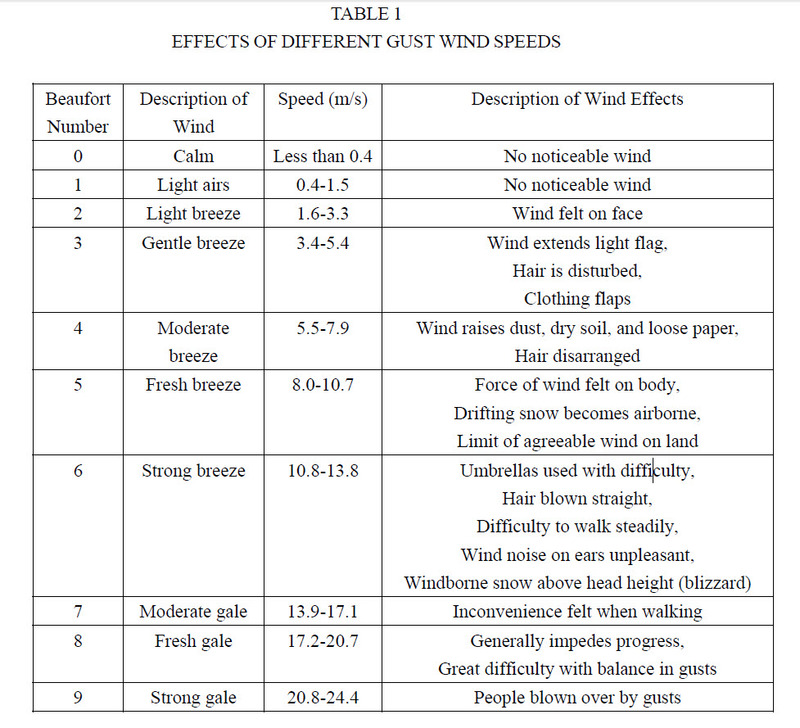 Yu presents the table below (taken from “Acceptable wind speeds in towns” A.D. Penwarden, 1973) showing the effects of gust wind speed on people. So wind at 39 to 46 mph will slow you down and it won’t take much of a gust or bit of turbulence to knock you off balance. By the time the wind reaches strong gale force (47 to 54 mph), it’ll knock you down if you don’t brace yourself. Penwarden’s chart doesn’t even venture into hurricane force winds which are over 75 mph. The chances of staying upright in those kinds of winds are slim. And finally, here is reporter Keely Chalmers at Crown Point Gorge, Oregon in 2007. She is attempting to report while standing in sustained winds of 60-70 mph with gusts measuring 100 mph. And, just to up the stakes, she is doing on a set of steps .. in heels. So that’s what it takes to blow away a reporter. Now I feel a song coming on. The human face is wildly unattractive at hurricane-force winds. Did you see his ears? They looked like puppy dog tail, wagging. Also, are all on-the-scene reporters uniformly idiotic, or did you just happen to dredge up some uniquely stupid specimens? Or perhaps it’s part of their job description: must stand in gale-force winds, show interest at high school football games, and be willing to be kicked in the groin by an ostrich at the local zoo… Check. Check. Check. You’re hired. To my memory, this dates from a decade ago when CNN would tie Anderson Cooper to a flagpole to demonstrate the power of wind. I’m just waiting until the day one reporter does, literally, get blown away: off his/her feet, in the air, gone; or decapitated by a hunk of flying car fender. Meg, I did no dredging in the making of this blog post. In fact, I lost the better part of an afternoon in Youtube going through the hundreds of fine examples to select the best ones. Seems there are many cub reporters (do people still say that?) trying to earn their “embedded journalist” status. My only criteria for selecting videos were 1) victim had to be a reporter 2) they had to tell us the wind speed.